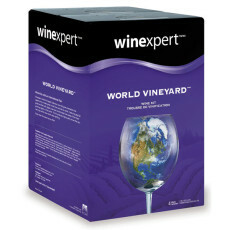 World Vineyard California Pinot Noir creates a lasting impression on the palate with an intense ripe-grape and black cherry aroma, accented by a spicy suggestion of cinnamon and mint. All the classic associations with this well-known grape variety used in Frances brilliant red wine blends are here in this Cabernet brought in directly from France: rich, intense aromas, deep berry fruits, healthy tannins, and a smooth, lingering finish. Originating from the world famous Maipo Valley wine region in Chile hails this great addition to our World Vineyard Series. This reputable Merlot is a soft and supple variation with powerful fruit and spicy flavors. The hot dry climate of Chile allows the grapes to reach excellent ripeness, with lush fruity characters making an intense, black wine.